I read this article and found it very interesting, thought it might be something for you. The article is called Army Doctors Flee Conflict Zones, Bunch Up In Safe Delhi and is located at https://archive.indiaspend.com/sectors/army-doctors-flee-conflict-zones-bunch-up-in-safe-delhi. The Comptroller and Auditor General of India (CAG), the auditor of governments and state-run companies, has exposed a fairly large gap in medical skills in the armed forces. The report says that while Udhampur Hospital in Jammu & Kashmir has a 25% shortage of doctors, Army Hospital Research and Referral (R&R), Delhi has 93% more doctors than required. Here are some other key CAG findings: There is an overall shortage of 12% medical officers in hospitals, 14% shortage in specialists, irregular deployment of nursing and paramedical staff, lopsided contract deals leading to overpricing of drugs and medical cadets opting out of service distorting the forces’ medical service. 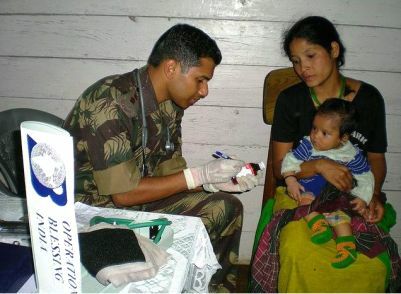 The objective of the Armed Forces Medical Services (AFMS) is to provide healthcare to armed forces personnel and their families. There are 133 military hospitals (Army-111, Navy-10 and Air Force- 12) spread across the country in addition to 90 field hospitals. In 2011-12, around 0.7 million patients were admitted and treated through AFMS. IndiaSpend’s Sourjya Bhowmick looks at CAG’s recently released report (report number 18 of 2012-13 for the period ending March 2011) on the performance of medical establishments in the defence services. The CAG report has highlighted the shortage of medical officers as the major issue. The shortage, according to the report, is due to non-rationalisation of posting medical officers. The overall shortage is 12%, and it can be explained by this: while Udhampur Hospital in Jammu & Kashmir has a 25% shortage, Army Hospital Research and Referral (R&R), Delhi has 93% more doctors than required. Table 1: Where Are The Doctors? It can be observed that against the authorisation of 3,863 medical officers and specialists, only 3,385 doctors have been posted in various hospitals. There is a gap of 483 health personnel, which is around 12%. Nursing and paramedical staff, the backbone of healthcare services, is again a victim of irrational deployment. In Command Hospital (CH) Pune, Chandimandir, R&R, Delhi, Delhi Cantonment and Jaipur, nursing staff is short by 39%, 30%, 21%, 3% and 25%, respectively. Meanwhile, paramedical staff in CH Chandimandir, Delhi Cantonment and Jaipur was in excess by 4%, 15% and 8%, respectively. One reason for the shortfall can be the fact that around 250 specialists left services prematurely during 2006-10. While 190 left due to supersession, 53 doctors left due to compassionate grounds and 7 due to low medical classification. CAG has recommended assessment of workload to correct such issues. Another important reason behind the shortfall in personnel is directly related to cadets leaving AFMS. Students passing out of Armed Forces Medical College (AFMC) are liable to serve AFMS. Surprisingly, during 2007-10, 73 out of the 508 successful candidates opted out of services by paying the bond money of Rs 15 lakh. Obviously, the bond money did not act as a deterrent while the defence services almost earned around Rs 11 crore through the bond money. IndiaSpend had earlier reported on how the intake of Sainik School students into National Defence Academy is also very low. CAG has recommended stronger incentives to hold them back…. The CAG report says that the same problems can be noticed in medical equipment and ambulances as well. Till December 2010, there was a shortage of around 22,108 electro-medical equipment for diagnosis but no deals were made for them. CAG noticed that there was a steep increase in procuring at a later stage, which proved that command hospitals did not correctly project the deficiency. X-Ray machines are provisioned for all 227 polyclinics but radiographers to operate them were not sanctioned in 79 polyclinics, resulting in many machines lying unused, the report said. The deficiency of four stretcher ambulances had increased from 48% to 57% during period July 2008 to July 2011. CAG examined 23 hospitals, and only 9 hospitals had ambulances as per requirement, 13 had deficiency and one had extra ambulances. The hospital in Jaipur had 50% deficiency followed by Ambala (46%), Jabalpur (40%), Jodhpur (36%), and Gaya (33%). The shortfall in two stretcher ambulance range from 16% to 45%. Let us now look at other concerns raised by the Auditor General: In the period 2006-11, fund allotment for local purchase of drugs increased from Rs 158 crore to Rs 371 crore, an increase of 135%. However, the increase in central purchase was a meagre 11%. Local purchase is meant for urgent and ad-hoc requirement as against the advantage of quality, cost and regulations of central purchase. Another reason affecting local purchase is that rate contracts were effective in only 44 drug items. This also leads to local purchases at a higher cost.For e.g. Oral Rehydration Powder costs Rs 1.5 at CH Bangalore and Rs 13 in INHS Ashwini. Infrastructure is another grey area of AFMS. It was decided in December 2002 that new and improved infrastructure was to be created in 104 polyclinics in military stations and 123 polyclinics at non-military stations within five years. As on February 2011, only 15% infrastructure was completed in polyclinics at non-military stations. To conclude: CAG has recommended that AFMS may regulate the postings of medical officers based on reasonable assessment of workload to even out the deficiencies, discourage exodus of medical cadets after passing out from AFMC by adopting suitable incentives/disincentives, and review availability of equipment in all hospitals and take immediate action to fill existing gaps.